leftover great northerns & tofu. 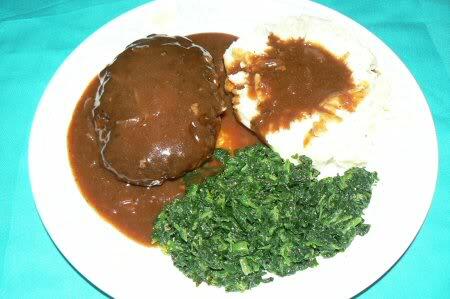 salisbury steak simmered in burgundy onion gravy, mashed taters and spinach. Grilled, Teriyaki-marinated chicken, sautéed spinach with bacon, and Sweet Potato Purée with Crystallized Ginger and pecans. i also make sautéed spinach with bacon and i sometimes add cubed potatoes to it. have you ever tried that? Tonight was clean out the fridge leftover night. Gee, I found some leftover white sangria. Hmmm, dessert! That looks deeeelish! I am making Mark a couple of beef patties (that's what he wanted) with leftover spaghetti pasta salad that I brought to the birthday potluck at work today. 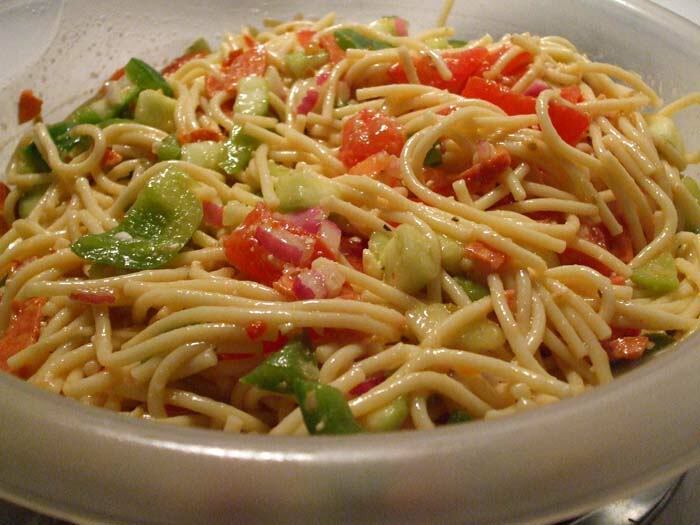 Here is the picture of the pasta salad from this morning, before I went to work. I also made little mini sandwiches with some really great rolls I found, and that is another thing I brought to the potluck today.... almost the size of White Castle. I have a few rolls left, so I made a little burger patty. I'm going to have a small cheeseburger with tortilla chips. I'll post that picture later. thank you LS and VB (the mashed taters kind of disappeared on the white plate lol and into our stomachs ). i would love a set of light purple or light blue correll (sp) plates. VB whats in your salad? looks great. well i had a pork steak thawing. went to hospital to see my friend and on the way home stopped at the Wrangler bbq place. had a pulled pork sandwich, beans and pretty awful pasta salad. nothing but pasta, not even a dressing so had to jazz that up. love their bbq sauce that is serving on the side. a nice treat.